From the start of the study, we have engaged with the Psoriasis Association, an integral partner in PSORT, to ensure the study met the needs of patients. 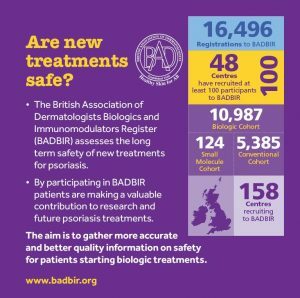 As a consequence of patient engagement, in the UK we have arguably the world’s leading safety registry for patients receiving biologic drugs for psoriasis – the British Association of Dermatologists Biologic and Immunomodulators Register (BADBIR). Currently over 150 hospital sites across the UK and Eire are taking part in BADBIR by recruiting participants to join the Register. Once a patient has joined BADBIR, they are followed via their dermatologist as we assess their clinical details. BADBIR’s current study end date is in 2028. During the lifetime of our proposal, it will have accumulated comprehensive information on 7,000 patients including responses (good and bad) to biologics. More information on BADBIR can be found on their website. The PSORT consortium includes representatives from 4 of the largest psoriasis clinics in the UK: Manchester (Salford Royal); Newcastle Foundation Trust; London (Guys & St Thomas’) and Liverpool (Royal Liverpool and Broadgreen). Together with participating satellite sites, these have provided the source for patient recruitment to our Discovery Study (PSORT-D) – Molecular and Immune Biomarkers in Skin and Blood. PSORT-D is an observational study of a longitudinal cohort embedded in routine clinical practice with patients recruited at 11 sites across the UK. As part of this study, we have collected clinical data and biological samples from psoriasis patients undergoing standard biological therapy (Adalimumab or Ustekinumab) at baseline, and at 1, 4 and 12 weeks after the start of therapy. Through this study we aim to develop scalable immune and molecular stratification biomarkers to inform psoriasis classification and treatment outcome prediction. In addition, this study will help to improve and extend our understanding of molecular pathways underpinning psoriasis drug response, disease biology, clearance and remission. The recruitment phase for the PSORT-D study closed in May 2018. However, persons interested in participating in psoriasis research can contact their local research nurses or clinic doctors to see what opportunities might be available to support such research. Patients with psoriasis have actively helped to inform PSORT’s programme of research through their involvement in a survey to determine the acceptability of taking skin biopsies for our research. Through the support of the Psoriasis Association, patients have also provided input into the survey design for PSORT’s Health Economic assessment into patient and clinician preferences for a stratified approach in biologics (Discrete Choice Experiment). This survey ‘Making choices in Psoriasis’ promoted through the Association’s social media channels and website, is now closed. The Biomarkers of Systemic Treatment Outcomes in Psoriasis study (B-STOP), a non-commercial observational study established in 2011 by Chief Investigator Professor Catherine Smith of the St John’s Institute of Dermatology at Guys and St Thomas’ NHS Foundation Trust seeks to identify and characterise biomarkers of response to systemic and biologic treatments for psoriasis.